Have you ever thought about adding a rug to your dining room but you’re not sure where to begin? Area rugs add warmth, style and can instantly elevate the design of any space! Now the question is how do you go about choosing the right rug for a dining room? We’ve narrowed it down to three key elements – style, durability and size. We will walk you through each one to help you find the perfect area rug for the dining room in your home. This one is always the most fun. There are endless possibilities of colors, patterns, and textures. An area rug can be used to brighten a space, add some color in a room, or have it tie all the other elements together. With endless options, you want to carefully consider one aspect of style and that is pile height. The dining room is a gathering spot of the home. You want to make sure any crumbs can easily be cleaned up and chairs can effortlessly slide in and out. Having a low pile will make clean up and mobilitya breeze. We can’t stress this one enough! Having an area rug that can withstand food, drink, and lots of foot traffic is really important. Take some time to do a little extra research before making your purchase. Check to see if it has stain resistant properties and is recommended for higher traffic areas. We have seen plenty of rugs not hold up to the consistent use of space. You want to make sure your rug is sure to last. When it comes to the size of an area rug, the numbers can be pretty cut and dry. Having 24″- 36″ inches from the edge of the table to the edge of the rug will allow chairs to slide easily. Also, 12″- 18″ inches from rug to the border of the room will help to fill the space. However, a lot of the time, the numbers are rarely that exact, and homes don’t always fall into the super specific categories of 8’x10′ or 9’x12′. One of the best parts about choosing an area rug for your dining room is getting to add a little unexpected style to your space. Feel free to experiment with color, texture and pattern but be sure to consider the durability and size. 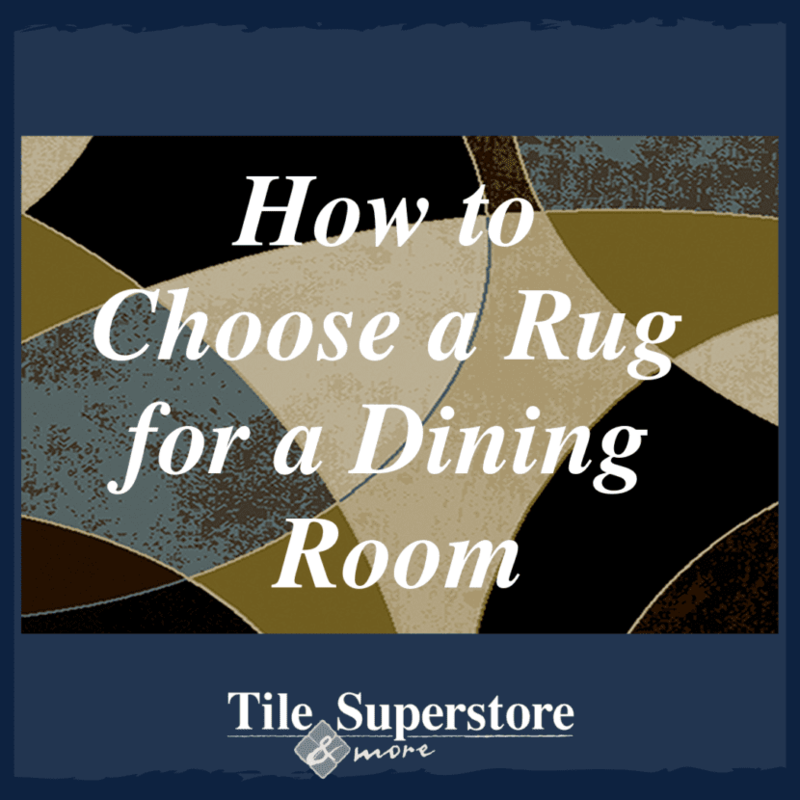 We hope you enjoyed our tips for choosing the perfect rug for your dining room! Check out our blog for more tips and trends, and make sure to like us on Facebook and follow us on Instagram & Pinterest!